Aug. 19 — Three years ago — Dieppe. A few of Doc Alexander’s medals, including, far left, his Victory Medal from the First World War, and right, the 1939–1945 Star and the Voluntary Service Medal 1939–1945 (bottom right). 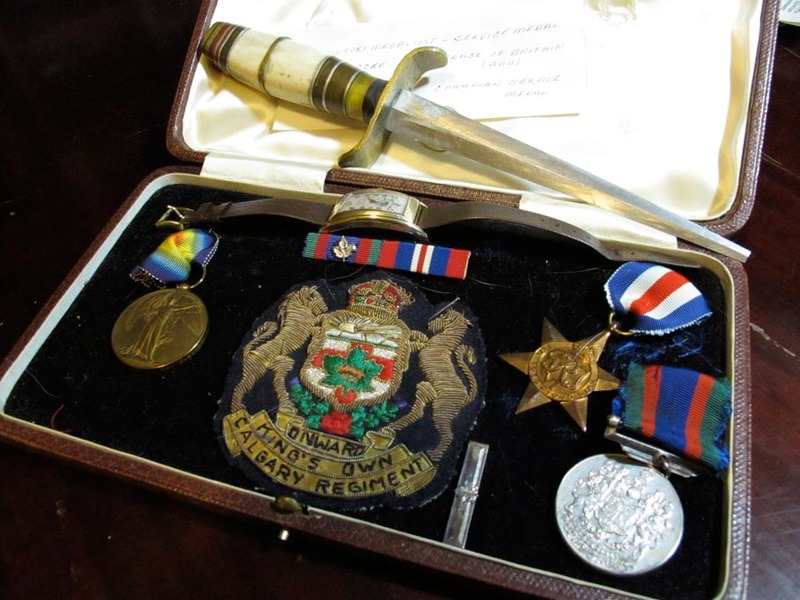 In the centre is his King’s Own Calgary Regiment blazer badge, his watch (dated 1939) and one of the five daggers he brought home as souvenirs. Today I went over to Guildford and spent the day with Wynne and her sister May. Had a very nice time. Tonight have been busy sewing on ribbons. As it is the 73rd anniversary of the Dieppe Raid, I’ve included the story I wrote about Doc Alexander’s experience—and that of his commanding officer in the Royal Canadian Army Medical Corps Lt.-Col. K. Hunter—on Tank Landing Craft No. 8 during the raid and a 2012 story Carrie Tait of the Globe & Mail wrote about my grandfather. Alex’s full Dieppe journal can be found here. After clicking the link, scroll down to Aug. 19, 1942 (or earlier if you choose) and then begin working upwards to read a play-by-play of Alex’s experience during the raid. Doc Alexander and Lt.-Col. John Begg. Alexander family collection. Capt. D.G. Purdy, CATR, Dieppe Canadian War Cemetery. Rob Alexander photo. Trp. C.L. Provis, CATR, Dieppe Canadian War Cemetery. Rob Alexander photo. Trp. V.F. Olliffe, CATR, Dieppe Canadian War Cemetery. Rob Alexander photo. Trp. T. Gorman, CATR, Dieppe Canadian War Cemetery. Rob Alexander photo. Dieppe Canadian War Cemetery. Rob Alexander photo. Gravestones for members of the Calgary Regiment in the Dieppe Canadian War Cemetery. Rob Alexander photo. TLC 5 burns flanked by a pair of Churchills from the Calgary Tanks. The bodies of a Canadian and a U.S. Army ranger lie on the beach. Rob Alexander collection. The aftermath. Calgary sits in the water in the foreground. Rob Alexander collection. Another view of Blossom. Rob Alexander collection. Caption written on the back of this photograph read: Actual photograph at Dieppe. One T.L.C. is in that explosion. One (TLC) to right. These things were happening all around us. Alexander family collection. The Churchill tank “Blossom” broke its right track in the chert as TLC 5 burns in the background. Rob Alexander collection. A handful of smooth chert pebbles taken from the Dieppe beach. Dieppe Operation map. The Calgary Tanks landed at Red and White Beaches. Rob Alexander collection. The Dieppe beach with its loose chert pebbles. Rob Alexander photo. The west cliff overlooking the beach. Rob Alexander photo. A German gun emplacement atop the west headwall with Red and White beaches in the background. Rob Alexander photo. The beach at Dieppe with its sharp “steps” in the loose chert leading to the seawall. Rob Alexander photo. The Dieppe beach. Rob Alexander photo. Looking from the jetty towards White Beach. Rob Alexander photo. The view from the west headwall looking east over White and Red Beaches. The jetty can be seen in the distance, with the seawall and esplande to the right. Rob Alexander photo. The Dieppe beach overlooking White Beach and north towards the jetty and Red Beach. Rob Alexander photo.